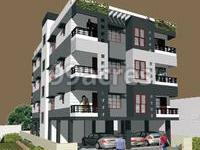 Keerthi Kiruba Palace in Moolakulam, Pondicherry by Keerthi Builders is a residential project. The size of the LAND is from 1395 sq.ft. 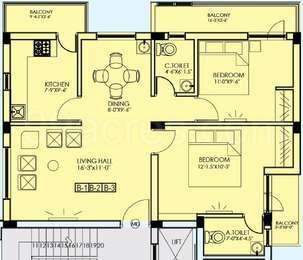 to 5445 sq.ft. Keerthi Kiruba Palace price ranges from Rs. Rs. 4.30 Lacs to Rs. Rs. 4.30 Lacs. The project is spread over a total area of 0.05 acres of land. Keerthi Kiruba Palace has a total of 1 towers. The construction is of 3 floors. You can find Keerthi Kiruba Palace price list on 99acres.com. Keerthi Kiruba Palace brochure is also available for easy reference. In which area is Keerthi Kiruba Palace located?The project is situated in Moolakulam, Pondicherry. What size of flats are available in Keerthi Kiruba Palace? The apartment size in the project is 1050.0. What is the area of 2 bhk in Keerthi Kiruba Palace? The size of a 2BHK unit in the project is 1050.0 sqft. How much is the total size of Keerthi Kiruba Palace?The project is spread over an area of 0.05 Acres. How much is price of 2bhk in Keerthi Kiruba Palace? 2 BHK units in the project are priced at Rs. 4305000. What are prices of apartments in Keerthi Kiruba Palace? Price of apartments in the project is Rs. 4305000. RCC framed structure designed on the basis of the soil bearing capacity test report taken into consideration the seismic load for zone2. All external filler walls of 230mm thick and inner walls of 110mm thick with all internal wall finished smooth with wall putty, primer and two coats of Asian make acrylic emulsion paint. Room doors are country wood frame with water proofing teak wood finish Flush Doors. Windows are UPVC with glass and Grills. Vertified tiles flooring for Rooms, anti skied flooring for toilets and wall of 7ft height, Wall tiles 2ft height for kitchen work top area. Black granite top, stainless steel sink. Wash basin in all Toilets and Dinning Area European water closet with Tank of Parryware make. Top Fittings ore of Guru make. All external painting of Asian ACE acrylic emulsion, weather proof, exterior paint. Three phase electrical wiring, modular switches, AC, TV and Telephone provisions in all bedrooms. Inventor provisions for each flat. Five Passenger capacity full automatic Lift. Reserved covered car parking at extra cost. All water supply are of municipal and borewell supply with common overhead tank or individual water tank. The apartment units are designed on Vastu Shastra principles.